Finding somewhere to put down a light stand on location isn’t always easy. Especially if those locations are woodlands or other wilderness areas where the ground isn’t exactly flat and level. They say that necessity is the mother of invention, and finding a good light stand on location was a need for motocross photographer Colin Brister. So, he made his own. The Spike. And now it’s available for you to buy, too. Originally made to help Joe McNally solve problems that would occasionally pop up on shoots, the Justin Clamp has become a popular addition to many photographer kit bags. It was created by Bogen/Manfrotto employee Justin Stailey from some standard off the shelf components. It served its function perfectly, so it became known as the Justin Clamp we still have today. While excellent, they’re not exactly cheap. A handful of these in your bag can set you back a couple of hundred bucks. Another Joe, photographer Joe Edelman, has different solution, though. A DIY option that costs about half of the original Manfrotto (less if you shop around), and it seems to be a very good substitute. I love these Frankenstein setups for supporting our gear. Whether it’s for cameras, lights, microphones, whatever. It’s rare that a single commercial option offers us everything we need, and sometimes we just have to mix it up. It’s why products like the Manfrotto Magic Arm exist, because a straight up light stand or tripod on its own just doesn’t give us what we want. In this video, Caleb Pike from DSLR Video Shooter shows off what he calls “the best light stand setup I’ve ever used”. Which is essentially a regular light stand, an articulated microphone boom arm, a ball head, a 1/4″ spigot and a couple of washers & wing nuts. It’s repurposing gear to work in a way it was not originally intended. But work it does, and very well, according to Caleb. 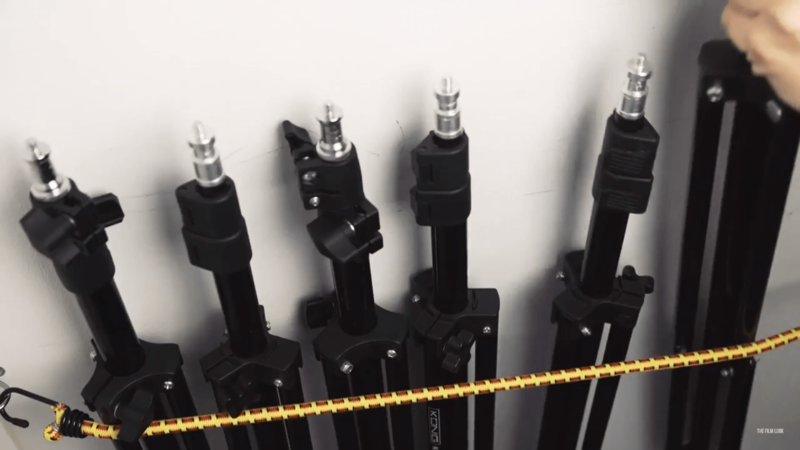 If you’re looking for a neat and simple way for storing light stands, tripods and booms, guys from The Film Look have come up with a simple solution and they share it in their latest video. All it takes are some screws, hooks and two pieces of bungee cord, and you’re all set. The stands and tripods usually end up crammed in a corner of the room or behind the door. This makes it difficult to reach the right one, especially if you’re trying not to tip over all the others. The storage hack from this video helps you organize the stands better, make them easily accessible, and also use up the otherwise unused space. And you’ll have to agree, it’s always good to use the extra space to the max. If you are a long time reader of the blog, you know that we love sand bags. I mean, what can ruin a shoot better than a piece of gear flying into the talents eye, right? Especially if they are talking about sand bags…. I thought that there was little to innovate in that area, but we saw the water weight bagel thingy last year, and now comes StandDaddy. The humble three legged light stand is a fantastic thing. But it’s not always best suited to every situation. 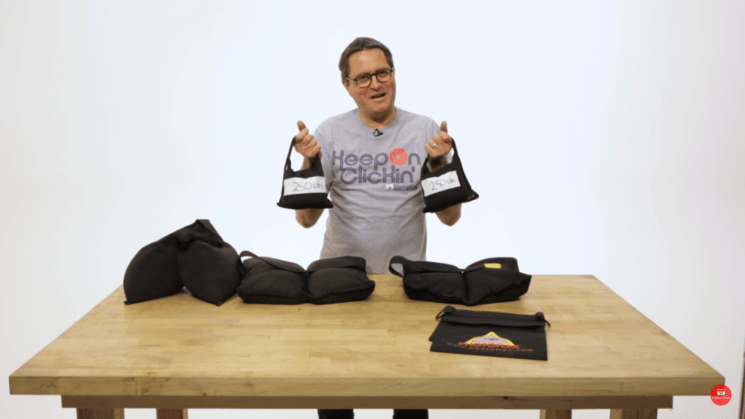 If, like John Decker, you’re trying to start up a new YouTube channel in your workshop, they can quickly get in the way. And they’re kind of a catch 22 design. Mostly they’re lightweight, for ease of moving them around. But with a big light on top, they get top heavy. If you make the base heavier, they’re more difficult to move. After taking a little tumble in his workshop which resulted in one of the lights falling over on top of him as he landed, John decided to design and build his own. He needed something with a smaller footprint, a lower centre of gravity, but still easy to move around the shop. Unless you have a dedicated boom arm, or a voice activated lightstand (an assistant) to do the job for you, booming microphones and lights overhead can prove to be a little tricky. Good boom arm stands can be expensive, especially if you want stability. This solution from the Frugal Filmmaker couldn’t have come at a better time for me, as I’ve been in the market for something to hold my microphone boom pole for a little while now. Being able to utilise a tripod I already own and would already be taking on shoots with me anyway will make life much easier.